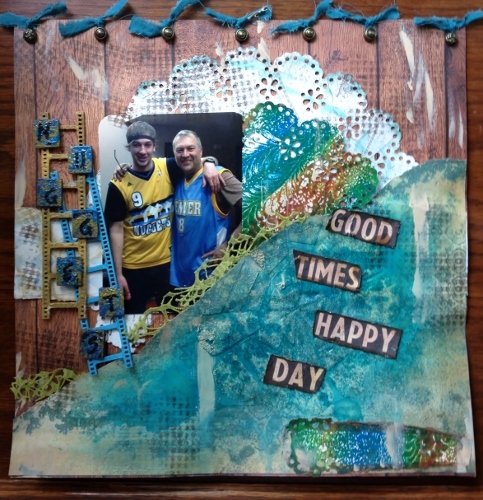 ← It’s Mixed Media Madness Baby! Hard to believe that summer is flying by so quickly! Completely amazing! I hope all of you are enjoying summer fun, good times, and lots of the beauty of nature. So much inspiration can be found all around us if we take the time to notice. I could probably spend a month of Sundays trying to get that purple shading and flow and nature reproduces it flawlessly time after time. Here are some of the things I’ve been working on since my last update. A good friend had his 70th birthday party and was his usual serious self–of course I had to memorialize the moment. It took all my restraint to keep the layout masculine and relatively unadorned. I framed it and gave it as a gift to he and his wife. Restraint be damned when I got to this layout! I could not get enough flowery adornment on this page! 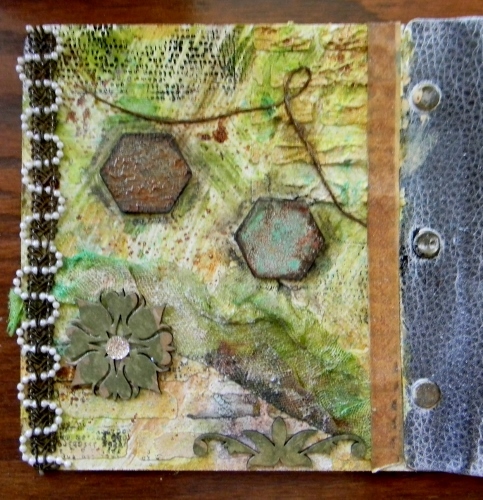 Switched gears from scrapbooking to some mixed media work on the canvas cover of a mixed-media album. I used gesso mixed with modeling paste to do my bricks. 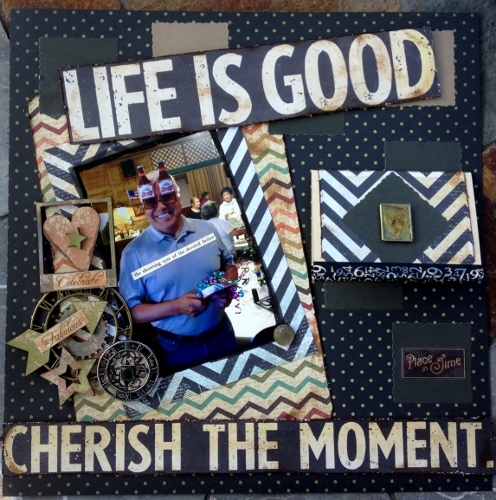 The frame and corner pieces are resin covered with black gesso and Inkagold. 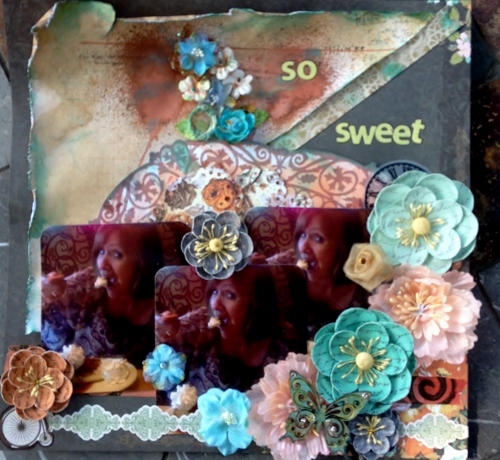 I made this project at the Swirlydoos art camp in June. The class was taught by Design Team Member extraordinaire Rachel Moses. I love my framed worry doll! My goal this summer has been to use up items in my stash because it seems to reproduce exponentially when I’m not looking. This layout I used some strips of fabric to make my ties along the top. 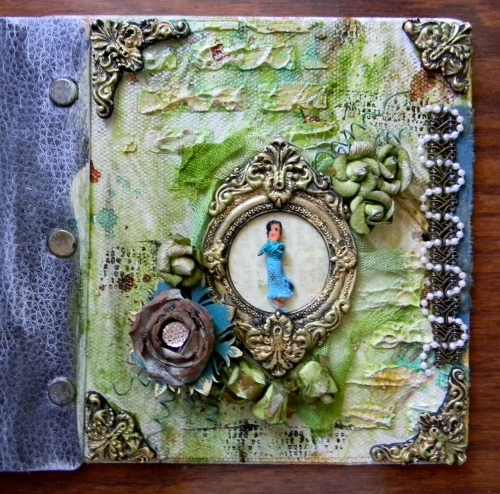 I used some gelli plate printed doilies, ribbon,and stenciled glass bead gel. The next layout is one featuring a picture of my crazy little fox terrier mix–Sophie. Do not be deceived by this precious photo of her slumbering comfortably on my husband’s pillow. 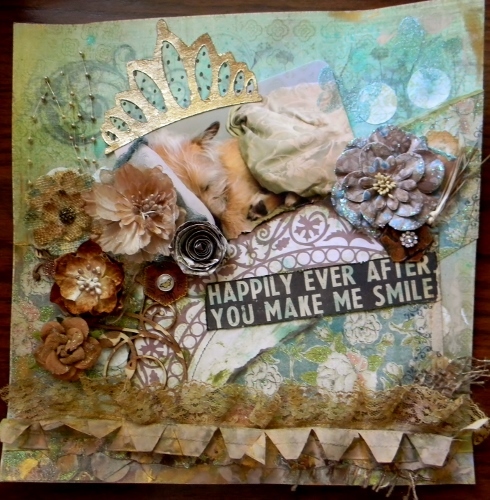 Lots of distressing and flowers and texture but the main thing about this layout is that I used a piece of paper that I had been “hoarding” for about four years. Yay me! I have more projects to show next time. See you soon and thanks for visiting today! Art Out With Your HeART Out! Ah, there you are! Nice to see you back again and with such great projects!! That art camp work is amazing – love what you are doing! Thank you Pauline! Hope you are working your creative magic! Yes, I’m back on top and have been very busy – come on over and have a look, always appreciate your thoughts! 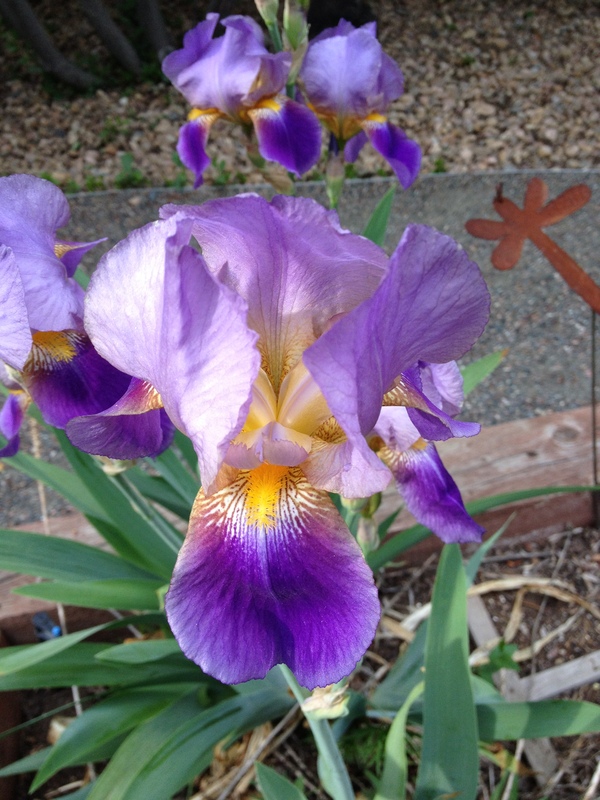 So much beauty “… all around us if we take the time to notice.” Totally agree! Wonderful projects! Thanks Peach! I appreciate it!